A confession: those Laurel Burch cat items? Not a fan. 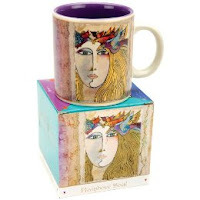 But this mug is kinda dreamy and pretty, and you can always just not tell people that the title of the art is "rainbow soul." Unless you love that that's the title. In which case, shine on, you crazy diamond rainbow soul. From Target.